Today Twitter has pre-announced about their entrant in new hardware business with the Twelfie Stick, a highly sophisticated and first of its kind device. 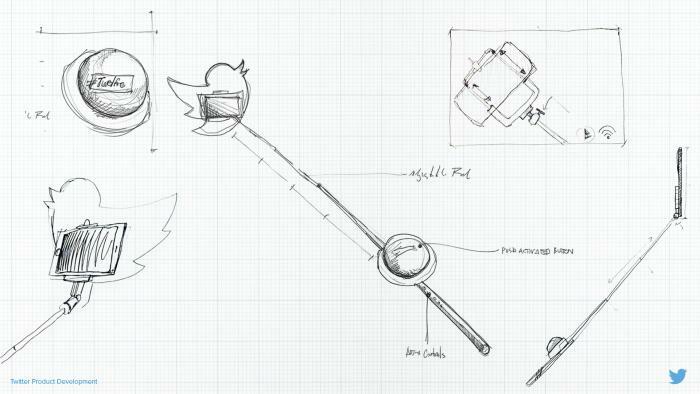 The Stick makes it easier for people to not only get the very best angle on their selfies but also Tweet them out directly from the Stick itself. Twelfie Stick is a thin and adjustable pole that extends from 10 inches to three feet, the Twelfie Stick was created with a combination of fiber/cyanate-ester resin, with a solar charging bicarbonate for renewable battery life. A remote shutter button on the bottom of the pole lets you take and Tweet your selfie (photos and videos) with just a simple click. And you’ll know for sure when your selfie is Tweeted, as the #Twelfie button makes a chirping sound as Tweets go live. The Twelfie Stick’s spring-loaded cradle is adjustable and easily compatible with all smartphones and cameras. The product will be available for purchase globally during the holiday shopping season for $39.99. We look forward to creativity eruptions with the Twelfie Stick and future Twelfie Stick branded accessories, which we anticipate announcing at some point in the future.